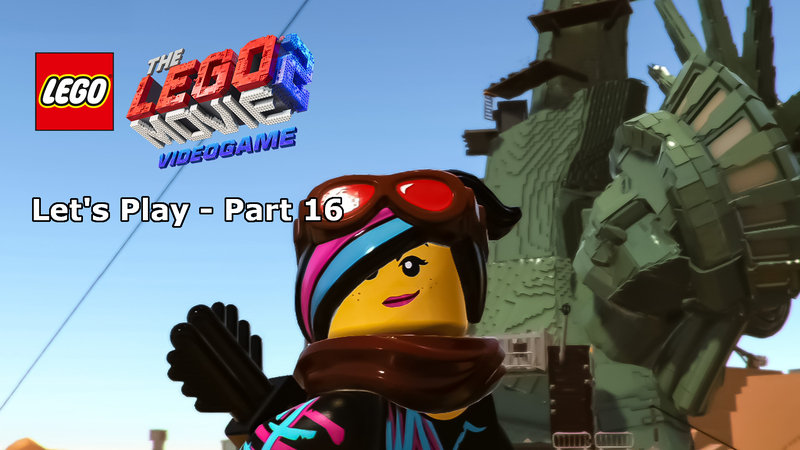 It’s been nearly five years since we were first introduced to Emmet and the master-builders, a movie adventure that proved LEGO had the brand power to make it big in Hollywood. The movie is universally loved (and unforgettable thanks to a certain song) and so it was no surprise to anyone when a sequel was officially announced in 2018. 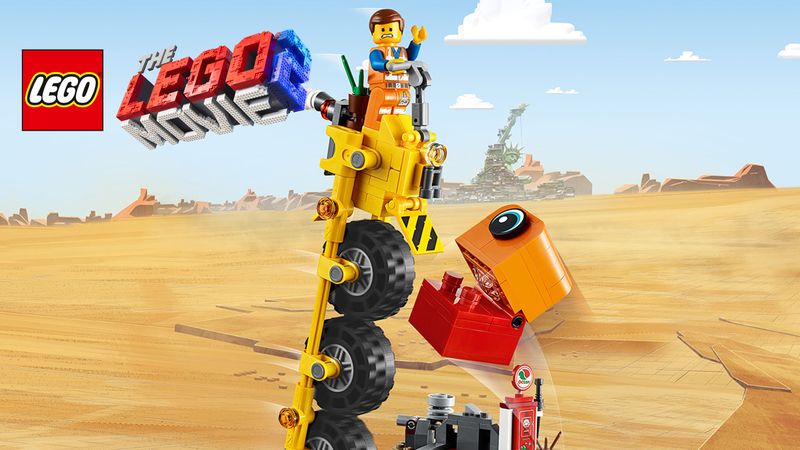 Here we are now only a few weeks away from the movie’s release and with LEGO Movie hype back in full-flow, the construction toy company has released a wave of tie-in sets to keep us fanatics happy until it’s cinema time. Ranging from the insanely popular Benny’s Space Squad at a meagre £8.99 through to the epic several-thousand-piece Apocalypseburg set coming out on February first, there is so much of this weird and wonderful world to enjoy. 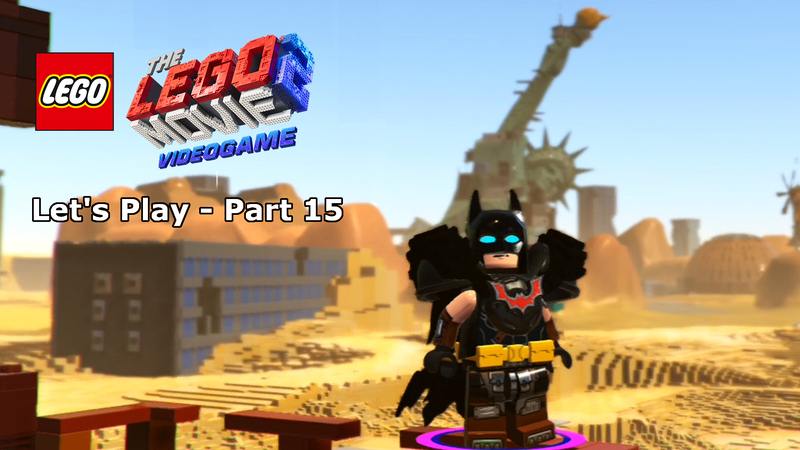 I’ve already got my hands on a few of the sets (including the aforementioned Benny set – yey! ), but I’ll be starting with one of the more bizarre low-priced designs, Emmet’s Thricycle, a vertically three-wheeled ride only someone with the vision to build a double-decker couch can truly appreciate. 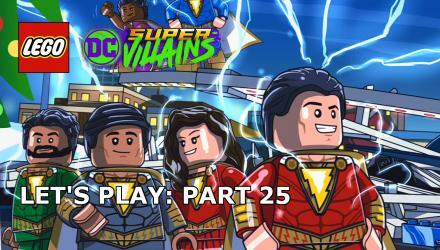 Well, the set is a little light on minifigures, with only the titular construction worker hero in the set. Even in such low-priced sets it is quite rare to only have the one minifigure, but piece-wise, the rest of the set more than makes up for it. 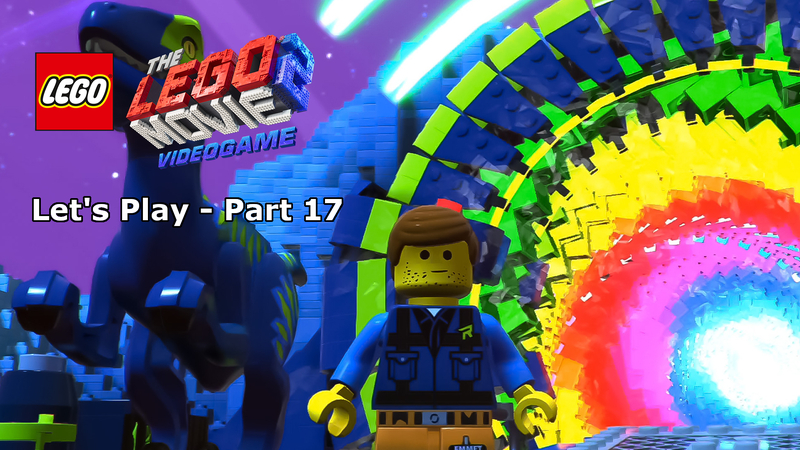 There’s very little in regards to exclusivity also, given that much like the LEGO Movie’s last run of sets five years ago, Emmet shows up in several other sets with little or no variation in printing. In terms of design, Emmet’s time in Apocalypseburg has clearly been less destructive than that of Lucy and the others. The design is, as one would expect, near on identical to the Emmet found in so many of the 2014 movie tie-in sets. The orange and silver striped construction worker uniform does, however, have a few very, very subtle differences, the kind of that you’d only spot under close inspection. The printing has been designed with deliberate wear and tear, simulating five years of reasonably careful use as the printing clearly looks like it’s been slightly chipped away on the black belt and the silver stripes, both front and back. It’s a great opportunity to get your hands on an Emmet minifigure if you missed out in 2014, but other than that this new figure isn’t going to add much value to your collection, sadly. 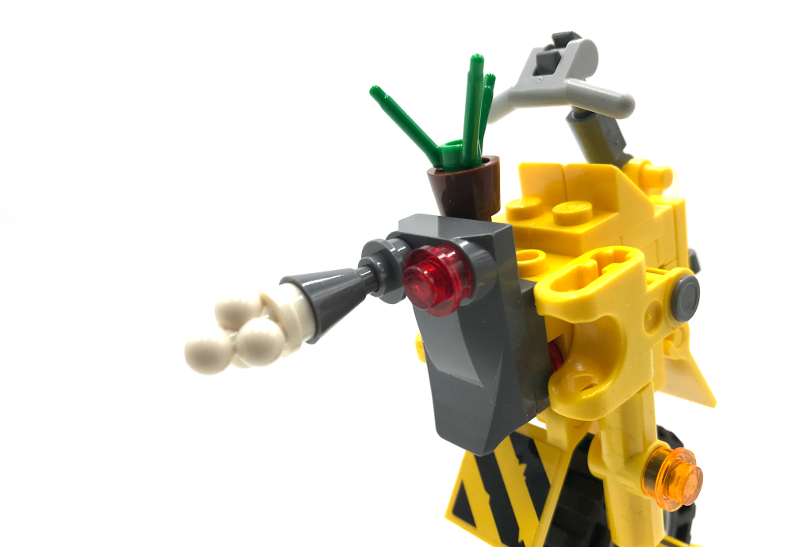 Despite the lack of minifigures, this set does offer a lot for your money and even before we get on to the bigger builds, there’s plenty of fun to be had with this bizarre, simplistic, and incredibly ingenious invader from the planet DUPLO. 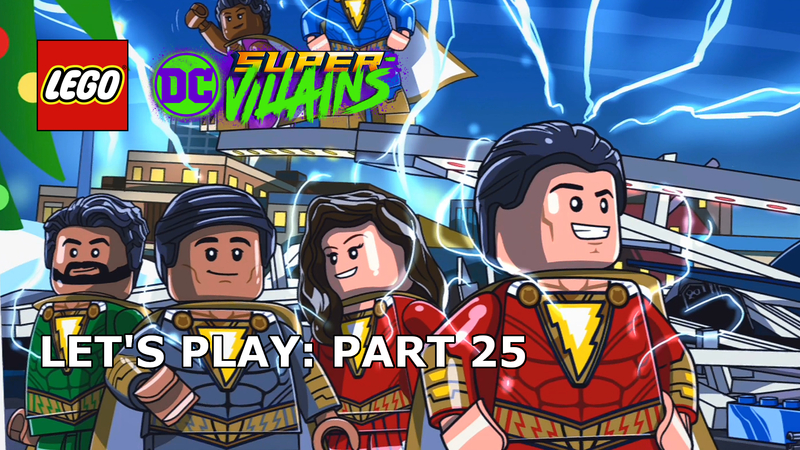 Rather than electing to use actual DUPLO, however, the set uses normal LEGO bricks to construct the look of the larger bricks – such a great decision, I must say. Having the flexibility of the smaller bricks means that not only do you get a slightly more complex build, but there’s room to throw in some artist flare. In this case, this blocked cyclops invader is cleverly designed to include a fully rotating eyeball using a small rod which subtly sticks out of the back. 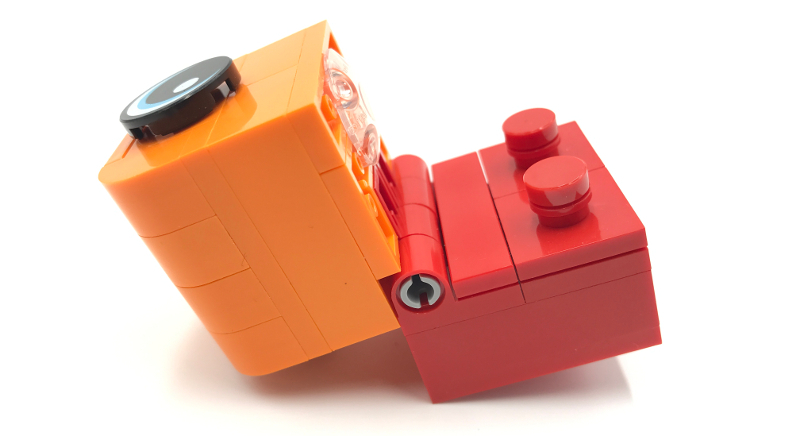 In addition, the two larger blocks are connector via a Technics pin hinge which acts nicely to provide this unusual creation with a mouth. For such a simple looking creation, this invader from the planet DUPLO adds a lot of fun to an already strong set for it’s price-range. Speaking of fun building, the secondary build is far from an afterthought to up the piece numbers. The fuel station has been designed specifically for Emmet’s vehicle, providing the perfect place to park the crazy Thricycle adding some stability for a wonderful LEGO collector display – it’s like they knew that AFOL’s would be buying this set too… That doesn’t mean, however, that this isn’t built for playtime. A great ten minute build, the fuel station comes, as expected, with a gas pump, while maintaining the bric-a-brac theme of this post-apocalyptic Mad Max-style environment. 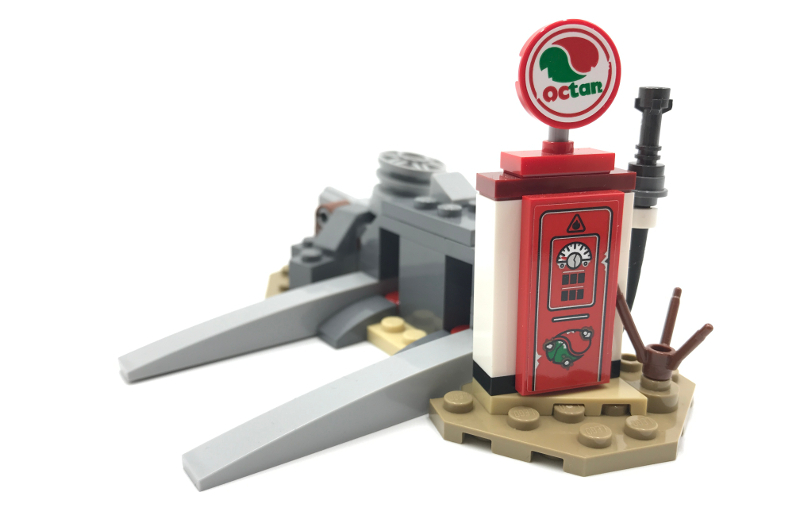 The gas pump looks fantastic, despite the use of stickers for both the Octan sign and the main pump-reader, and considering it towers over the minifigure, it’s the prominent part of the build. There’s a hose clipped to the side which can be used as part of any play-time adventure as well. On the other side of the central ramp (which perfectly fits the Thricycle), there is a bit of weird creation, a wheel catapult. In all honesty, it looks like the designer has come up with the great ramp and fuel pump design and then run out of ideas for the other side. I shouldn’t be cruel, however, because it does have play value and may have more context in the movie, but I’ve seen better designs on sets of a similar price. On to the main attraction, the main build of the set and it’s superb. Back in 2014, one of the highlight sets for me was the double-decker couch, a simple idea and a brilliantly fun and silly build. 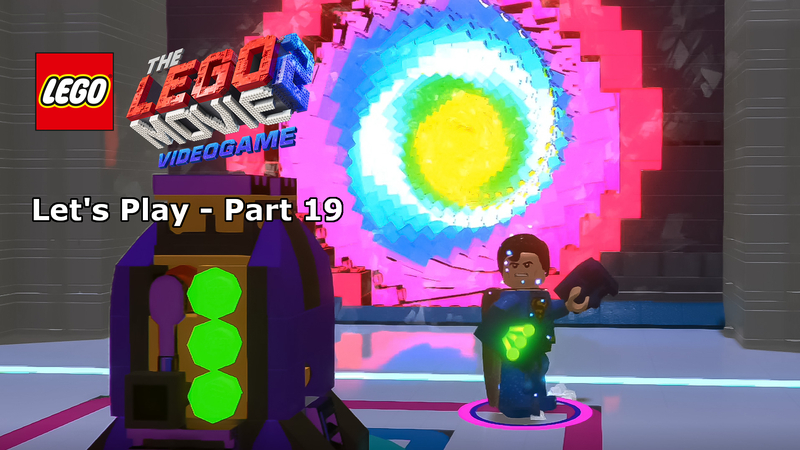 While I’ve not had a chance to experience all that the LEGO Movie 2 has to offer, this definitely seems like a good follow-up to the couch for the very same reasons. A question I’m sure only Emmet can answer, but why hasn’t anyone considered building a motorised tricycle with the three wheels stacked vertically? This crazy creation sits 6 inches high, so when you throw in the minifigure, this makes two-story LEGO houses look short. The one thing to say about this vehicle is that the finished product looks a lot more complex than it is to build. This doesn’t mean in anyway that it is a boring build, if anything it’s a compliment as despite the limitations on piece numbers for the set, the designer has created something unique and anything but cheap – though those black and yellow stripes are sadly stickers and not printed pieces. 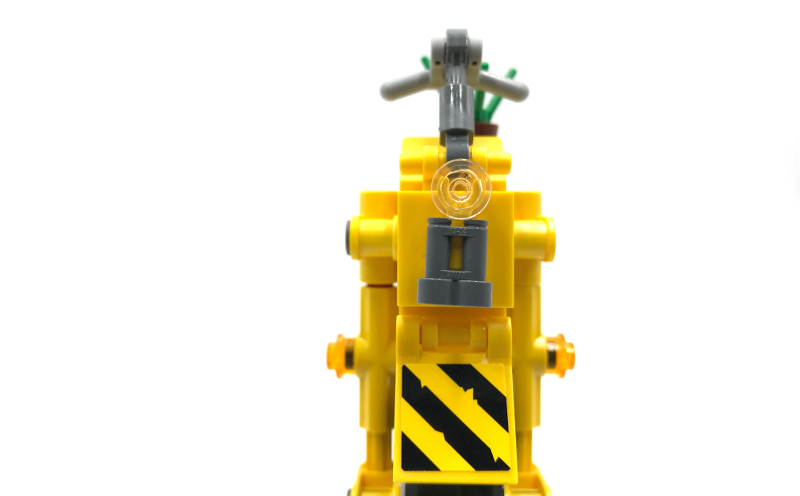 Split into two primary constructions, the top block is actually where this build begins with a block of yellow bricks and clips as the platform comes together, complete with handle bars, headlight, exhaust and, most importantly, Planty. 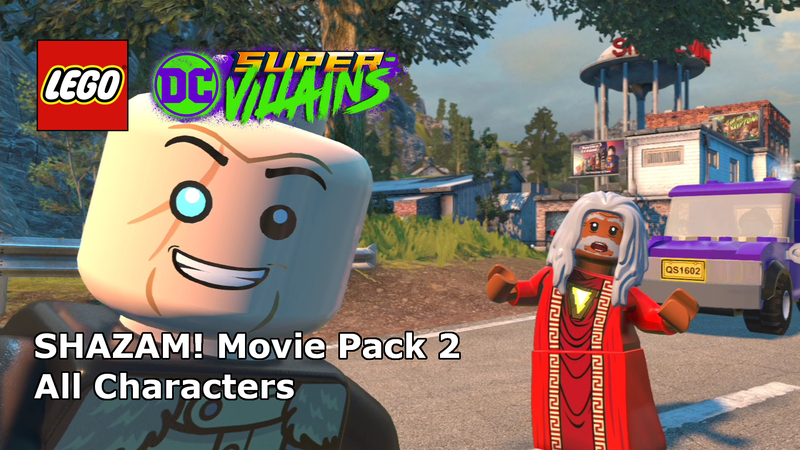 You could, of course, ditch Emmet’s best friend and have room for two minifigures on here instead. This is top-half is, however, fair static, there are no weapons, no stud shooters, what you see is what you get. The only real interactivity you have with this section of the Thricycle is the mud-guards which can be angled how you like, and similarly there are options with regards to the handle bars. 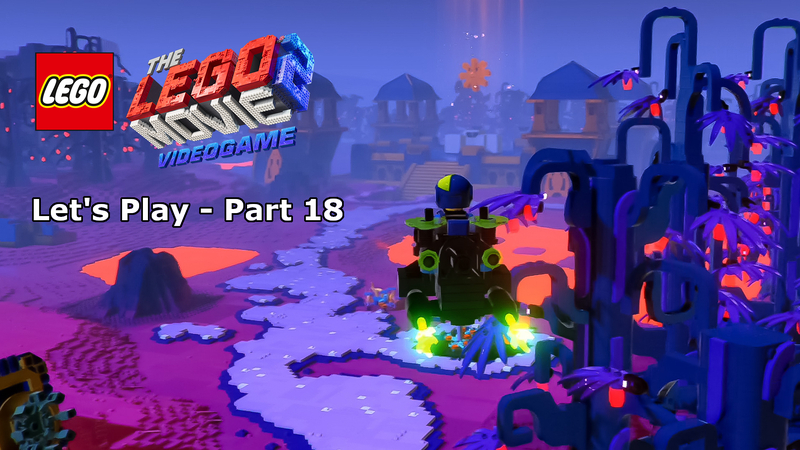 The rest of the build is where it get interesting as you put the platform to one side to stack those huge wheels. 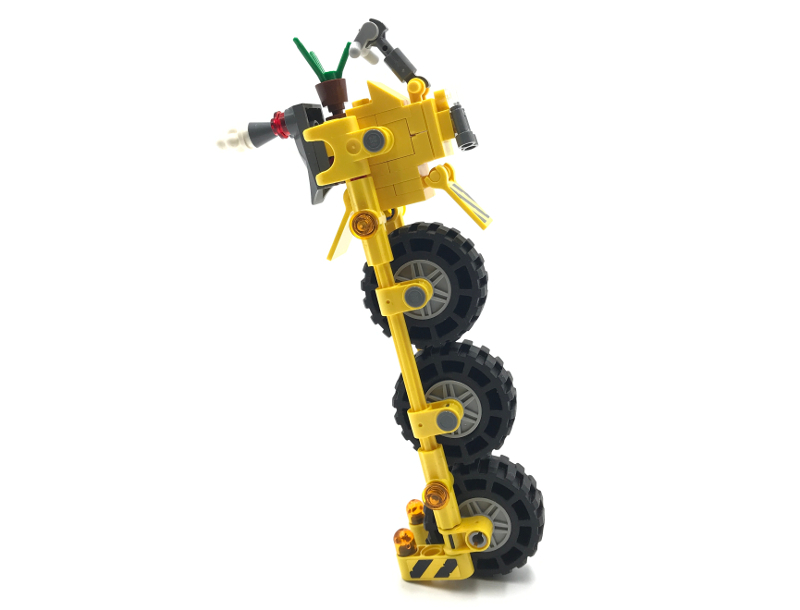 A couple of long rods serve as the structural support for this unique vehicle with a clever yet simple mechanism at the bottom to provide stability and allow the Thricycle to free-stand on a flat surface. Either side at the bottom are three-pin wide Technics bars which rotate out to give the vehicle a stand, a must to ensure it doesn’t topple over and while it may not look like much, it’s a very effective design that works surprisingly well – check out our Instagram page for an example of how well it free-stands in a scene. 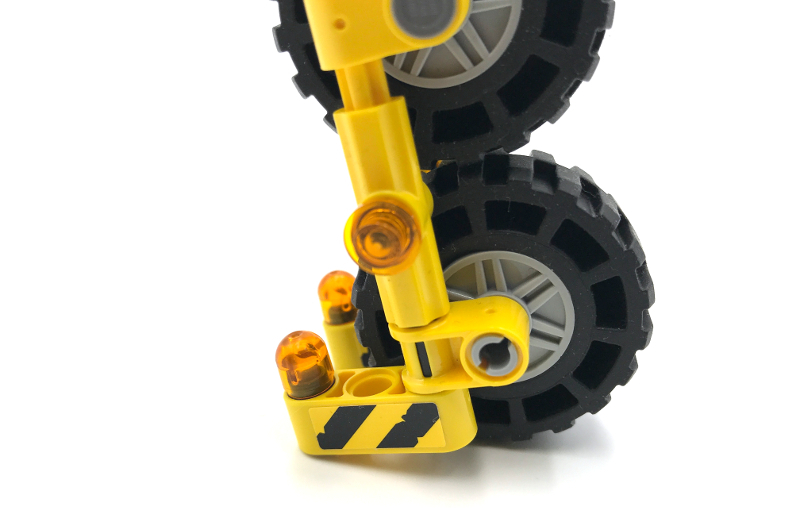 There’s a little bit of repetition in this build, as you might expect, when clipping the connectors into the wheels and then sliding them down the poles into position, but the end result is superb. Once the top-half has been connected there’s still room for the wheels to move up a little, meaning that there’s no chance of the wheels getting jammed. 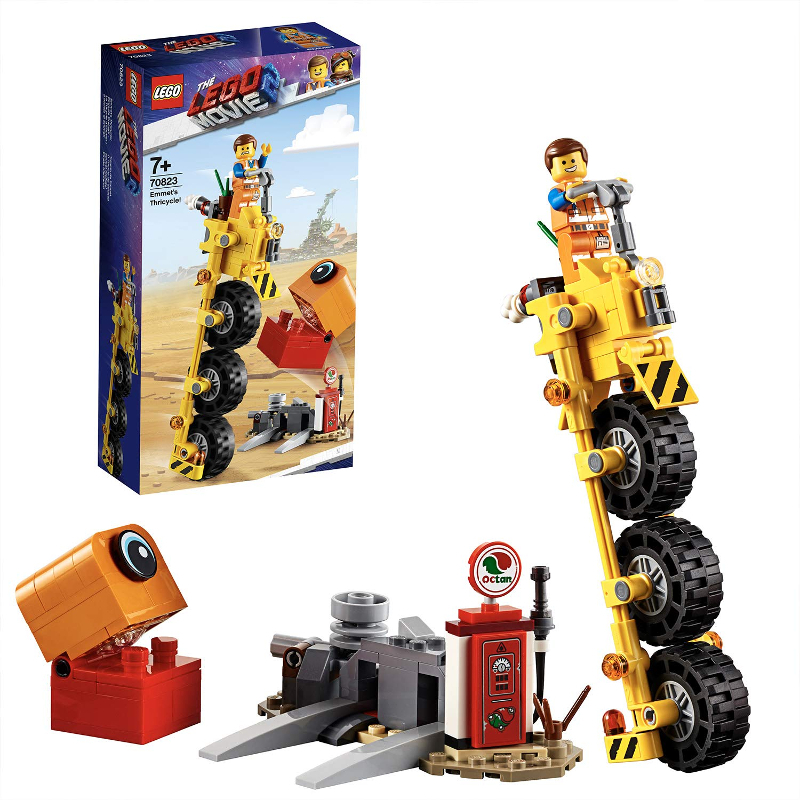 When your LEGO fan is playing with this set, however, the Thricycle looks fantastic with all three wheels moving together. Despite being minifigure light, this is a great set for it’s price. 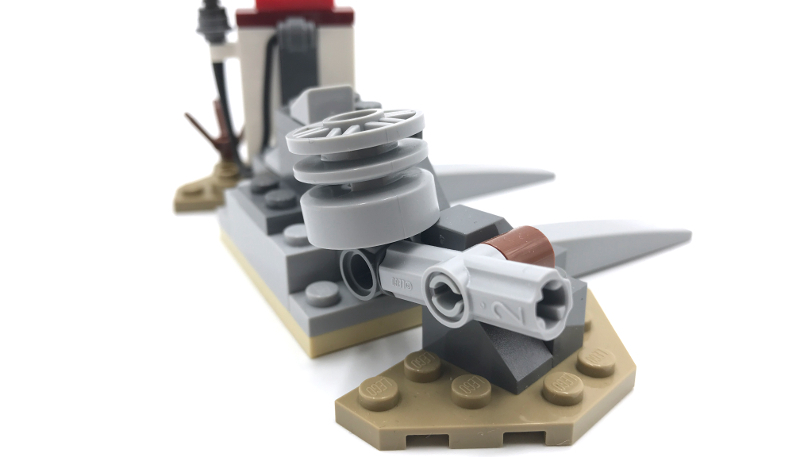 Yes, long-term fans of LEGO aren’t going to be rushing to buy this set for the non-exclusive Emmet, but the titular Thricycle will more the peek the interest of collectors and younger fans alike. 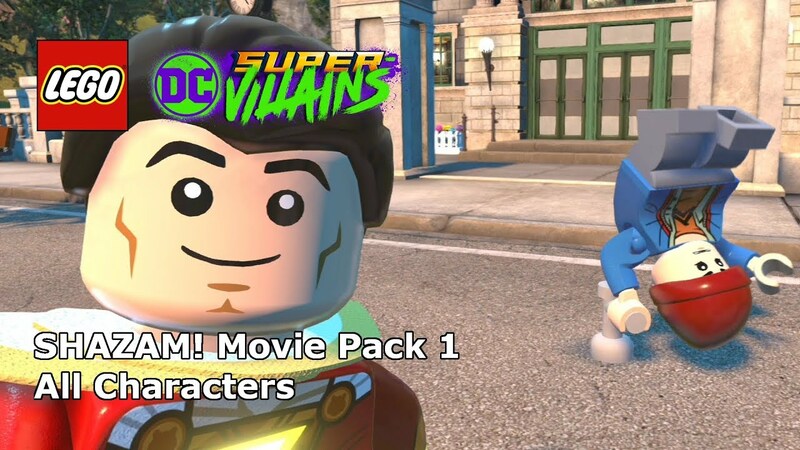 Including the DUPLO alien invader, you’re getting three fun builds out of this set and yet none of them will challenge younger fans of the franchise. Due to the hybrid nature of the vehicle and the scenery. you’ve got a perfect collectors item that’s easy to display, but also the perfect prop to connect with the crazy-looking vehicle for extended play-time adventures. 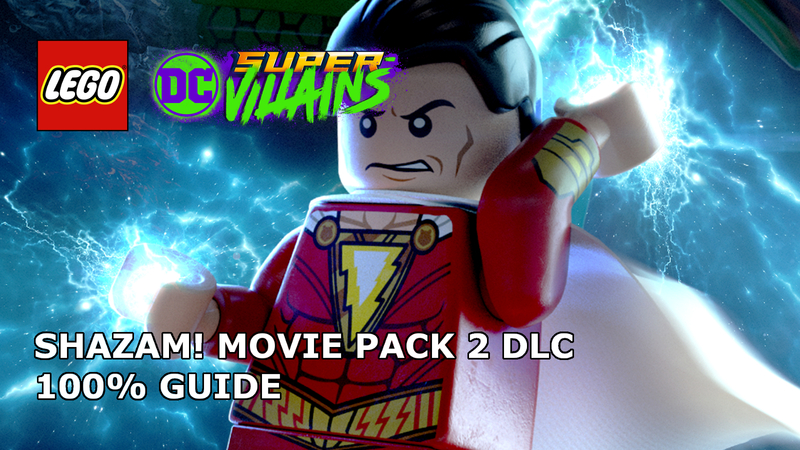 It’s a great set on it’s own, but it’ll surely compliment the rest of the LEGO Movie 2 collection brilliantly if you’re lucky enough to have them. 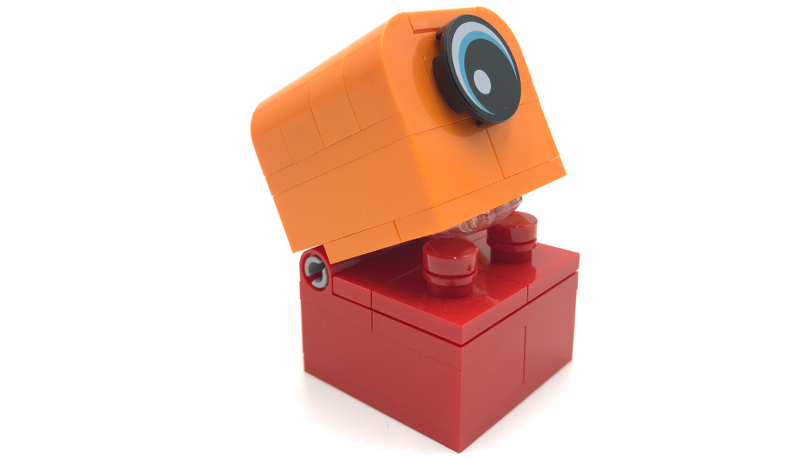 The Duplo alien created using conventional LEGO bricks is fun, functional and looks awesome. The two main builds, the Thricycle and fuel stop compliment each other brilliantly. The price, you get a lot for your buck here. The low piece number means nothing when you look at what you create with it. A strong budget set with a fantastically designed, unique creation. You’re unlikely to find another set that looks anything like this and that is part of the appeal. If you’re an experienced master-builder then the unique design will appeal. 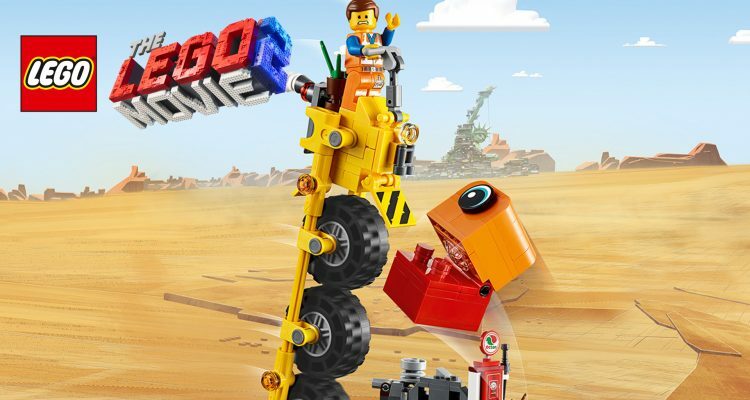 If you’re a parent looking for a price-friendly LEGO set that will engage your young LEGO fan then you can’t go wrong here. Worth every penny. I am thankful to the owner of this web page, great review and fantastic post.